Dutch Bank ABN Amro Commercially Launches Payments Wearables with System to Provision after Sale | NFC Times – Near Field Communication and all contactless technology. ABN Amro in the Netherlands has launched a payments wearable service using passive devices that can be provisioned in the field. 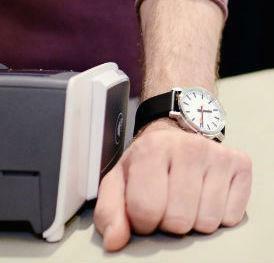 While the bank proclaimed in its announcement that the service makes ABN Amro the first bank in the world to “offer wearables enabling users to pay higher (daily) amounts at the point of sale using PIN,” this ability is also available from nonbank payments wearables providers, such as Apple Pay with the Apple Watch. What may be more uncommon is the provisioning system that ABN Amro is using to deliver its tokenized debit card credentials to the passive wearable devices after they are sold to consumers. All ABN Amro retail banking customers can buy analog watches, rings and bracelets online from four different OEMs and then have them loaded and personalized with Mastercard-generated tokens and personalization data in the wearable makers’ own distribution centers. From there they will be shipped to the consumers to be activated online. The OEMs participating in the bank’s payments wearables program include Swiss watchmakers Mondaine and Olympic and UK-based K Ring, formerly known as Kerv. Article has about 1660 words.